ON NOVEMBER 18th 1993 a gathering of South African political groups of virtually every stripe approved a new constitution, enshrining equal voting rights regardless of race. Nelson Mandela would not be elected president until the following spring but apartheid was over. Ever since his release from prison in 1990 the momentum towards black rule had been unmistakable. Most whites accepted the loss of power yet fretted that extreme violence and economic breakdown lay ahead. Black-on-black quarrels were taken as alarm bells. 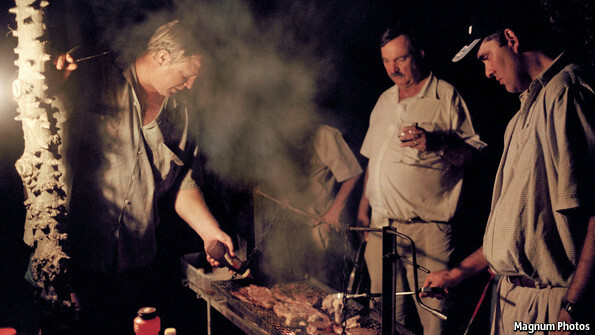 By the end of that decade, perhaps a fifth of the whites had emigrated; others withdrew to suburban ghettos to enjoy a braai—Afrikaans for barbecue—on weekends among their kin. But the next two decades turned out much better than expected. Crime may be worse than under apartheid, yet most whites are relatively well protected. They make up 9% of the country’s 52m people but fewer than 2% of murder victims. Racially motivated bloodshed is fairly rare. South Africa’s economy is not growing as fast as those of neighbouring countries, partly owing to the ruling African National Congress (ANC), but the market has stayed free, enterprise flourishes and South Africa remains the biggest and by far the most sophisticated economy on the continent. The most successful media mogul, Koos Bekker, is white. South Africa’s pluralistic democracy is well entrenched. After its post-apartheid exodus, the white population began expanding again. The most educated are part of a cultural elite that is as vibrant as ever. Economic and moral sanctions were lifted a generation ago and international links continue to spread. Publishing and journalism thrive, projecting distinct white voices. Still, the lives of many whites exude sadness and isolation. They tend to stay close to Johannesburg and the south-western sunspots around the Cape. In a few in-between towns like Potchefstroom, west of Johannesburg, the commercial capital, they strut their stuff. In gated communities such as Kleinfontein, to the east of it, hardliners hunker down in all-white “cultural villages”. Retired teachers run hotels in the Karoo desert. Two decades after the end of apartheid many whites see their country ebbing still further away. Afrikaners, those of mainly Dutch descent, who still make up 60% of whites, mourn the steady demise of Afrikaans, their ancestors’ language. Its throaty tones are no longer heard in the public sector, and most universities have stopped holding lectures in Afrikaans. For the ANC the change is symbolic. Afrikaans was the language of apartheid. In exile in Zambia and Britain its leaders spoke English. Yet Afrikaners are not all doing badly, especially in business. The four biggest media firms when the ANC took over were of roughly equal size, three of them run by Anglos—whites of an English-speaking heritage. Mr Bekker, an Afrikaner, now dwarfs them, having made his company 42 times bigger than its nearest rival (by investing abroad) and himself a billionaire, taking his entire salary in share options. Such talent is evident elsewhere in the often gloomy community. During apartheid, Afrikaners staffed almost three-quarters of the civil service. No matter how dim, they were virtually guaranteed a job, even if it was to watch over blacks who did the actual work at a fraction of the pay. No more. Rian Malan, an iconoclastic Afrikaner writer, discerns a useful spur. “It got people going,” he says. Three out of four Afrikaners—often less well educated than Anglos—are self-employed today. One group of former Afrikaner civil servants runs a taxi firm for foreign diplomats. Even so, in economic terms whites are losing. Their income per person is still highest but South Africans of Indian descent (under 3% of the population) are catching up fast and will eventually overtake them. White poverty is growing. Perhaps 10% live below the poverty line. Destitute whites in rags beg on street corners. All-white squatter camps have sprung up, with residents in shacks made of sheet metal. They survive on odd jobs and complain that poor blacks get more help from the government. Breyten Breytenbach, a writer and anti-apartheid campaigner, has sympathetically chronicled their plight. Whether rich or poor, many whites are disgruntled. They grouse about ANC cronyism and corruption as well as “black economic empowerment” rules which benefit well-connected blacks more than the masses. White-owned businesses above a certain size must share control with blacks. This is meant to make up for unfavourable treatment during apartheid. In reality it bolsters a new black elite. White disgruntlement has spawned some vile but mostly harmless extremist groups. A pop singer, Steve Hofmeyr, recently led a “Red October” march to protest against a “genocide” of whites. A few weeks later a court sentenced five leaders of a group calling itself “the Boer Army” each to 35 years in prison for a white supremacist plot to assassinate Mr Mandela and drive blacks out of the country. AfriForum, a “human-rights group”, goes to court to defend whites’ “minority rights”. Most whites, some blacks and many Indians and Coloureds (as those of mixed race are still known, amounting to 8% of the population) support the Democratic Alliance, a liberal party that has been gaining ground—but nothing like fast enough to challenge the ANC’s ascendancy soon. It governs the Western Cape province and may get a quarter or so of the national vote at the general election next year. Its white leader, Helen Zille, has said her successor will be black. She is trying to broaden the party’s base, perhaps by softening its pro-market economics. Overall, whites are politically marginal. The ANC has always had quite a number in senior posts but few of their children are likely to rise to the top. Racially charged language is common in public discourse. Firebrands like Julius Malema, a former ANC bigwig who has founded a populist party, calls for Zimbabwe-style land grabs. Mindful of the ANC’s vulnerability on its angry left flank, Cyril Ramaphosa, the miners’ leader-turned-tycoon who is the country’s suave deputy president, has warned that not voting ANC means “the Boers [literally “farmers”, as Afrikaners were called] will come back to control us.” Perhaps unsurprisingly in the wake of apartheid, the racial climate is still often toxic. White guilt, black anger, plus prejudice and misinformation on all sides, still cloud South African whites’ existence. Read 2570 times	| Like this? Tweet it to your followers!